On this page you will find a variety of relaxation exercises as QuickTime files that you can play on your computer. These relaxation exercises were developed by Prentiss Price-Evans, Ph.D. Please contact me with questions. The ability to relax is important in effectively managing stress and anxiety. When we feel stressed, our bodies react with what is called the "fight or flight" response. Our muscles become tense, our heart and respiration rates increase, and other physiological systems become taxed. Without the ability to relax, chronic stress or anxiety can lead to burnout, anger, irritability, depression, medical problems, and more. Allowing yourself to deeply relax is the exact opposite of the "fight or flight" response. Herbert Benson (1975) described what he referred to as the "relaxation response." This is the body's ability to experience a decrease in heart rate, respiration rate, blood pressure, muscle tension, and oxygen consumption. There are many benefits to being able to induce the "relaxation response" in your own body. Some benefits include a reduction of generalized anxiety, prevention of cumulative stress, increased energy, improved concentration, reduction of some physical problems, and increased self-confidence (Bourne, 2000). In the workplace, stress may be related to lost hours due to absenteeism, reduced productivity, and worker's compensation benefits. This costs the American industry more than $300 billion annually. Utilizing a relaxation exercise to help reduce stress or anxiety is like learning to ride a bicycle for the first time. It is a skill that takes time and practice to do it effectively! We cannot expect to develop a relaxation skill after trying it one or two times, just as we cannot ride a bike well when we first try. Relaxation exercises can seem deceptively simple at first, but using them well when stress is high requires practice. For each of the relaxation exercises below, it is recommended that you find a nice, quiet place where you know you will not be disturbed for the duration of the exercise. 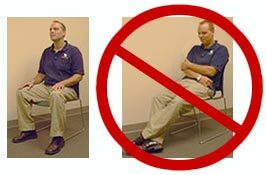 Find a comfortable chair that will allow you to sit up straight using good posture (see photo). How you sit in your chair is important for maximum benefit. Push the small of your back to the rear of the chair and sit upright. This will allow you to take long smooth breaths, and your lungs to fully expand with oxygen. Do not cross your arms or legs, but sit with your legs at a ninety degree angle. Rest your arms comfortably in your lap without using armrests. If you use armrests, this might lead to muscle tension in your shoulders, neck and back. Many people prefer to close their eyes during these relaxation exercises. If you do not wish to close your eyes, you might find a fixed point in the room and let your gaze fall upon it. Discontinue the exercise if you experience physical or emotional discomfort. You might try each of the relaxation exercises offered on this page. Many people find that they prefer one or two more than the others. When you find which one/s you like, it is recommended that you practice them every day so you can build the skill and make the exercise more effective for you. We suggest that you start with the "Diaphragmatic Breathing" as this is an important introduction for the other exercises. The relaxation exercises below may be played using QuickTime. If you do not have QuickTime, please download the latest version by clicking on the icon below. It is recommended that you begin with this relaxation exercise. In this introduction, you'll learn how to make relaxation exercises work effectively for you. Skills for proper breathing tecnhiques are demonstrated. Presented by Dr. Allan Vives (length: 9:13). Go to the Diaphragmatic Breathing audio file. Enjoy being guided step-by-step through deep breathing exercises that will give your lungs a pleasant, soothing workout. Learn to pace your breathing for maximum effect. Presented by Dr. Jodi Caldwell (length: 6:43). Go to the Deep Breathing I audio file. In this meditative exercise you will learn to focus on your breathing and allow intrustive thoughts to melt away. This skill is good for taking a break during a busy day. Presented by Dr. Prentiss Price (length: 7:28). Go to the Deep Breathing II audio file. Learn to recognize when and where you hold tension in your body and how to effectively release it, allowing yourself to fully relax. Presented by Dr. Tobin Lovell (length: 8:39). Go to the Progressive Muscle Relaxation audio file. Take a mini-vacation as you are guided through the sights, sounds, smells, and sensations of a pleasant walk along the beach. The "best" version of this audio file has sounds of the ocean in the background. Presented by Dr. Prentiss Price (length: 6:06). Go to the Guided Imagery: The Beach audio file. Let yourself be guided on a peaceful walk through a beautiful, lush forest near a trickling stream. The "best" version of this audio file has sounds of the forest in the background. Presented by Dr. Chuck Zanone (length: 7:07). Go to the Guided Imagery: The Forest audio file. Sometimes it is helpful to repeat certain phrases to yourself in order to deepen your state of relaxation. A series of phrases are presented by Dr. Wendy Wolfe (length: 6:14). Go to the Relaxing Phrases audio file. Introduction: Much of the emotional distress people experience is the result of thinking about upsetting things that have already happened or anticipating negative events that have yet to occur. Distressing emotions such as anger, anxiety, guilt, and sadness are much easier to bear if you only focus on the present - on each moment one at a time. These are exercises to increase your mindfulness of the present moment so that you can clear away thoughts about past and future events. These meditations are presented by Dr. Wendy Wolfe. Adapted from: Linehan, M. M. (1993). Skills training manual for treating borderline personality disorder. NY: The Guilford Press. Benson, H. (1975). The relaxation response. New York, NY: Morrow. Bourne, E. (2000). The anxiety and phobia workbook. (3rd. ed). Oakland, CA: New Harbinger Publications, Inc.
Miller, L., & Smith, A. D., Rothstein, L. (1994). The stress solution: An action plan to manage the stress in your life. New York, NY: Pocket Books.